During the last presidential campaign, the poet Naomi Shihab Nye had the daunting task of introducing Caroline Kennedy at an Obama campaign event in San Antonio, Texas. The honor was made particularly formidable because Ms. Kennedy’s plane had been significantly delayed. On Thursday evening, Ms. Kennedy returned the favor by introducing Ms. Nye, the final speaker at Featherstone Center for the Arts Festival of Poetry. “Naomi is a wonderful and joyful and exuberant example of somebody who uses poetry to enlarge the world of others,” said Ms. Kennedy. Ms. Nye is the daughter of a Palestinian father and an American mother. Her books of poetry include 19 Varieties of Gazelle: Poems of the Middle East, and Hugging the Jukebox. In addition to her own poetry, Ms. Nye has anthologized books of poetry, including several for children. A recipient of an impressive list of awards and fellowships, her incisive writing, keen eye, advocacy for social justice, and comic timing have earned her a devoted following. “Newspapers have been getting thinner everywhere except Martha’s Vineyard,” noted Ms. Nye to a round of laughter. Her own advice, for poets, is to send out their work. “It seems to me that if you don’t send your work to people, people will have a hard time finding it in your drawer,” said Ms. Nye. Before the fast-paced event came to a close, Ms. Nye invited Ms. Kennedy back onto the makeshift stage to discuss anthologies. Ms. Kennedy’s most recent anthology of poetry is She Walks in Beauty: A Woman’s Journey through Poems. Ms. Kennedy spoke of her family’s tradition of giving each other poetry for holidays and birthdays. “That was a wonderful gift that my mother also gave to us. It gave us the freedom to explore poems and pick the ones we like,” said Ms. Kennedy. Ms. Nye and Ms. Kennedy talked about the power of anthologies and the process of creating them. Ms. Kennedy recalled that she wanted to put together an anthology about friendship. “I couldn’t find anything and I thought, this is unbelievable. Poets don’t have friends.” So she wrote to Ms. Nye to see if she could think of any poems about friendship. Ms. Nye immediately responded, “Of course, there are millions.” A few days later she wrote back. “I actually can’t find any either.” This inspired her to reach out to her poet friends; slowly a new anthology is born. 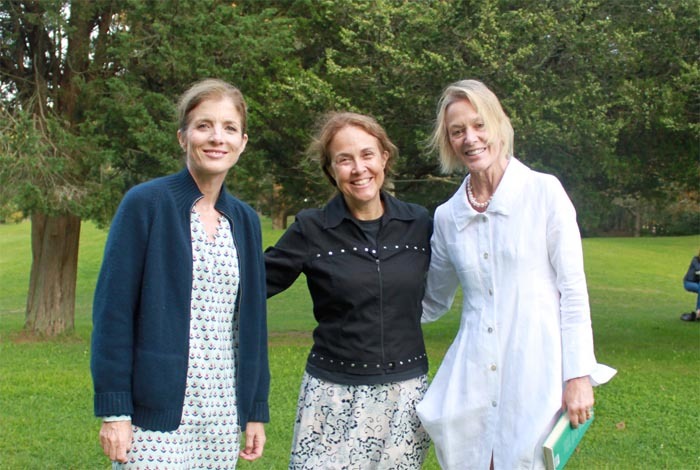 This summer’s Festival of Poetry, which celebrated the Featherstone Center for the Arts 15th anniversary, had an impressive roster of nationally celebrated poets that included Tina Chang, Billy Collins, Robert Pinsky and Stan Strickland. The poetry series was cofounded by Fan Ogilvie and Justen Ahren.